I just came across an Interview of Manny Inumerable in Landmarks (a TV show on net25) showcasing his museum in Taal, Batangas called “Galleria Taal“. So here is the video for your reference. Galleria Taal showcase a collection of old camera and a heritage house owned by Manny Inumerable and his ancestors. This is one of the great place to visit in Taal. Manny is a civil engineer, businessman, and President of Stage Riggers, Inc. Off work, he is a camera collector, photo enthusiast, and member of the Zone V Camera club since 1989. 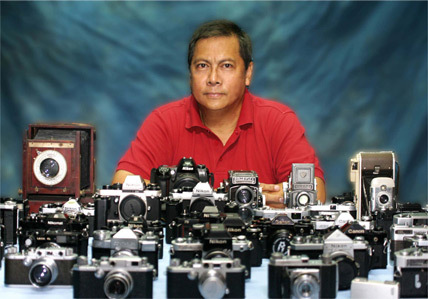 Manny was also Past Chairman of the Photoworld Asia 2010. Galleria Taal is situated along Agoncillo St. which is the main street in Taal Town and about 500 meter from the Basilica of St. Martin de Tours, leading down to Lemery, Batangas. Very near the Galleria Taal, are other museums such as the Apacible Museum and Agoncillo Museums.